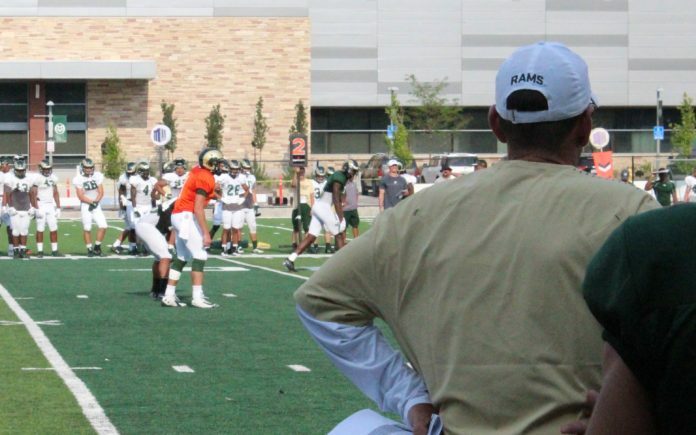 How far can the Colorado State Rams football team go this year? It seems, as far as their coaching staff can take them. There has been a massive overhaul in terms of coaching at CSU this offseason, with six new coaches calling Fort Fun home. But, the biggest and most important constant has been Mike Bobo. Unfortunately for everyone involved, Bobo has been experiencing numbness in his feet and was admitted to the hospital for further testing recently. We go through his and Joe Parker’s statements following the scary trip to the doctors for Bobo. On the field, Bobo’s Rams went through their second scrimmage of the fall in preparation for the season’s kickoff, which is now only 11 days away. Who impressed in that scrimmage and who could have done better? We go “1st and 10” for ten quick facts about the scrimmage, and then break down three of them in further detail. We hear from linebacker leader Josh Watson as well as starting running back Izzy Matthews, who wants to be a “bad MF” this year.